The Font of Knowledge: A "compound disaster". The deaths of Arthur Griffith and Michael Collins. This article was written for the Irish Medical News, August 18th 1997. 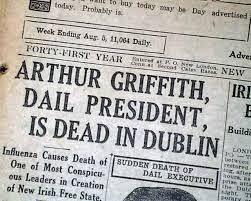 Both Arthur Griffith and Michael Collins died 75 years ago this month. Prof Risteard Mulcahy looks at the medical aspects of their untimely deaths. 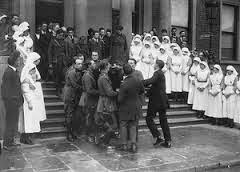 In his historical note about St Vincent’s Hospital, “The first hospital owned and directed by women,” (Irish Medical News, 3/3’97), Dr Charlie Meenan refers to Arthur Griffith and Michael Collins. 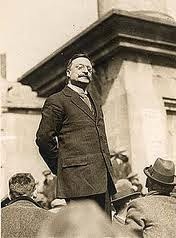 Arthur Griffith founder of Sinn Fein and President of the Dail from the ratification of the Treaty in January 1922 to his death on August 12, 1922, died in St Vincent’s Hospital. 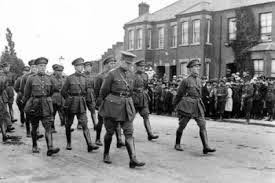 Michael Collins was appointed Chairman of the Provisional Government following the Treaty ratification, and therefore was de jure head of State. He was Commander-in-Chief of the army (as head of state) from July 13, 1922, to his death on August 22. He was killed in Cork and, because of the interruption of rail and road services by the irregulars, his body was brought to the North Wall by boat and transferred by gun carriage to St Vincent’s Hospital, where it arrived in the early morning of August 24, 1922. Both men died at the height of the Civil War and their deaths were described by my father, Richard Mulcahy, who was Minister of Defence and Chief of Staff at the time, as the ultimate tragedy for the emerging young State, a tragedy that underlined what he described as the “compound disaster” of the Civil War. Speculation on the cause of Griffith's death. Griffith’s death was attributed by some people at the time to a broken heart, but, with a little more realism, it was generally accepted that he had died from a stroke. However, the diagnosis entered on the death certificate was a subarachnoid haemorrhage. He was cared for in the private wing of St Vincent’s Hospital at 96 Lower Leeson Street, by Oliver St John Gogarty, who signed the death certificate. There is no record of a post-mortem examination. I always had reservations about the cause of Griffith’s death. The circumstances were more suggestive of ventricular fibrillation and coronary heart disease. It occurred after he was admitted to the hospital for treatment, Padraig Colum, in his biography of Griffith (Arthur Griffith, Browne and Nolan, Dublin 1959 – p 373) writes that Dr Gogarty admitted him because of insomnia and “an imperceptible stroke”. However, there was no evidence of a neurological deficit while he was in hospital. He was mobile at the time, visiting his office every day, and about to be discharged when it is recorded that he collapsed in the nursing home. Kathleen Galvin, who was a nurse there at the time, informed me that his death was instantaneous. After his collapse, he was seen immediately by Dr Jim Magennis and Mr Harry Meade, who had been finishing an operation in the private theatre. A few minutes later, St John Gogarty arrived, but Griffith was pronounced dead as soon as doctors got to his side. 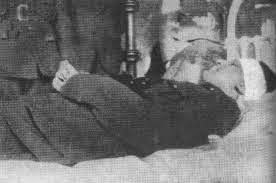 Michael Collins died towards the end of the engagement at Béal na Bláth. Because of testimony at the time, it was believed that he was killed by a bullet fired by the irregulars which ricocheted off the armoured car or off the road before it entered his head. However, occasional suggestions have been made that he was shot by one of his own men, but the circumstances of his death makes such a possibility highly unlikely and the information about his head wound would strongly support the view that a ricochet bullet was the cause. He was laid out in 58 St Stephen’s Green, a private wing of St Vincent’s Hospital. According to Fletcher of the Department of Anatomy at UCD, a post-mortem examination was carried out by Jimmy Redditch, the head porter at the Anatomy Department of the Royal College of Surgeons, with St John Gogarty in attendance. However, it is likely that the procedure was confined to a superficial examination of the head wound and to preparing the remains for embalming and the lying in state at the City Hall. Fletcher told me that the embalming fluid used was formalin and that eosin was added to retain a pink colour in the face. This would be confirmed by Lavery’s painting of the dead Collins, which shows him with normal lifelike colouration. Perhaps Calton Younger, in his Ireland’s Civil War (Muller, London 1968 – p435) is correct when he states that no post-mortem was carried out. Unfortunately, despite enquiries with the College more than 40 years ago, I was unable to obtain any record of the examination, nor was such information available from the hospital. Beaslai, in his biography of Collins (Michael Collins and the making of a new Ireland, Phoenix, Dublin, 1926 – p437) quotes Emmet Dalton, who was with Collins when he was killed. “There was a fearful gaping wound at the base of the skull behind the right ear’’ Carlton Younger writes that the body was examined by a Dr Leo Aherne in Cork who, like Dr Gogarty later, was sure that the wound was caused either by a ricochet or a spent bullet. Ulick O’Connor in his Oliver St John Gogarty (Mandarin, London 1990) writes of Gogarty: “With fine skill he was able to hide the gaping wound in the back of the head.” The photograph in Younger’s book of Collins’ body lying on a bed in Cork with a wide white bandage around his head was consistent with his having an extensive head wound. These facts are recounted to support the widely expressed view that he was killed by a ricochet bullet and not as the unsubstantiated and bizarre opinion of a few anti-Treaty commentators who suggested that Collins was killed by one of his own men. The circumstantial, strategic and medical evidence clearly contradicts such a possibility. Kathleen Galvin, who was acting night matron on the morning of August 24, gave me a most poignant account when I was a young consultant there in 1950 of the arrival of the Collins horse-drawn gun carriage. The remains arrived at the North Wall very early. She described the moment – about four in the morning, and shortly after rain had fallen, with the cobblestones glistening in the early light – when the gun carriage appeared and moved slowly from the Shelbourne Hotel to the hospital steps, preceded by a makeshift army band playing the moving and evocative Scottish dirge “The flowers of the forest.” She talked about the emotional turmoil of that moment and of the intense sadness of the scene. St. Vincent's staff watch as Collins' body is taken away. I also had a description from Kathleen of Kitty Kiernan’s arrival later in the day. She was very close to Collins and was probably expected to marry him. “She was dressed in a dark grey suit and a white hat. She was swooning and behaving in a most dramatic way” before she laid a lily on the coffin and then sat beside it for a prolonged period in a trance.